Professor O’Donnell attended Medical School at the Queen’s University of Belfast in Northern Ireland between 1994 and 1999 where he graduated with distinction combined with the award of the Northern Ireland Medico-Legal Prize for Forensic Medicine. He completed his surgical training as a Specialist Registrar on the Northern Ireland Surgical Training Rotation between 2006 and 2015. He passed the FRCS Exit Examination at first attempt in 2012 and was recently awarded first place in the European Board of Vascular Surgery Examination in 2015. He has also completed the United States Medical Licensing Board Examinations. During his surgical training Professor O’Donnell established a prolific publishing interest with over 100 publications in PubMed Indexed Peer-Reviewed journals, over 100 published abstracts and more than 250 international and national presentations. He has previously been awarded the Society of Vascular Surgery International Scholar Award, Society of Academic Surgery Prize and Belfast City Hospital Young Investigator of the Year. Written submission of theses culminated in the completion of a Medical Doctorate in 2008 evaluating ischaemia-reperfusion in patients with peripheral arterial disease and a Master of Medical Science in Education for the Healthcare Professions with Distinction in 2009 evaluating career choice in Foundation Doctors. He continues to lecture at Ulster University and is a regular reviewer for more than 20 medical journals. Completion of a Vascular Surgery Fellowship at the World-Renowned Mayo Clinic in the United States between 2012 and 2014 not only complemented his vascular surgery skills but facilitated endovascular proficiency for a range of minimally invasive treatments for complex arterial and venous disease. He was appointed as an Assistant Professor of Surgery at the Mayo Clinic and developed an interest in medical simulation and military trauma education. He has also passed the Physicians Vascular Interpretation Examination of the American Registry for Diagnostic Medical Sonography. Recent appointment as a visiting professor to the Ulster University has confirmed his established interest in academic research and innovation for optimisation of vascular patient clinical care and overall safety. He is the current lead investigator for the UK Omniflow Bioprosthetic Graft Registry and is a faculty tutor for the Royal College of Surgeons Basic Surgical Skills and START courses. 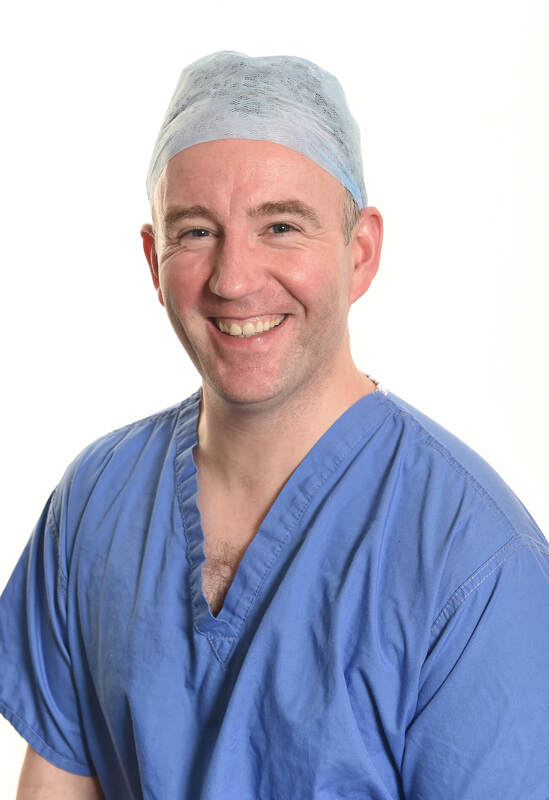 Professor O’Donnell was previously appointed as a Consultant Vascular and Endovascular Surgery at the East Lancashire Hospitals NHS Trust in 2015 providing patient care for the full remit of vascular diseases. He was vascular lead for internet web presence and media, clinical effectiveness and was a member of the Research and Development faculty at the East Lancashire Hospitals NHS Trust. He remains proud of the Diabetic Limbs at Serious Risk (LASR) service which was commenced in September 2015 and his supervisory role for Higher University Degree Theses. His recent move back to the Northern Ireland Vascular Centre based at the Belfast Health and Social Care Trust in April 2017 recognises his continued commitment to high quality, patient focused clinical care in one of the largest vascular units in Great Britain and Ireland. In Northern Ireland, he has NHS clinical privileges at the Royal Victoria, Belfast City and Altnagelvin Hospitals. With regard to his Private Practice, Professor O’Donnell performs office consultations for all aspects of primary and complex arterial, venous and lymphatic disease at the Kingsbridge Private Hospital, North West Independent Hospital and The Newry Clinic. He provides the full remit of varicose vein treatment including endovenous radiofrequency ablation, foam sclerotherapy and microsclerotherapy as well as open surgery for complex or recurrent veins at the Kingsbridge Private Hospital and North West Independent Hospital. Fellow of the College of Phlebology (FCPhleb) – September 2017. Member of the Faculty of Surgical Trainers, Royal College of Surgeons of Edinburgh (MFSTEd), United Kingdom – August 2015. European Board of Vascular Surgery (FEBVS Honours), Maastricht, Holland – March 2015. Physicians Vascular Interpretation Examination (RVPI), The American Registry for Diagnostic Medical Sonography (ARDMS) - December 2013. Fellow of the Royal College of Surgeons of Edinburgh (FRCS), United Kingdom – March 2012. General and Vascular Surgery Exit Examination, Intercollegiate Specialty Board of Surgery, United Kingdom - February 2012. Education Commission for Foreign Medical Graduates (ECFMG) Certification – March 2011. United States Medical Licensing Board Examinations (USMLE) - Step 1 August 2010, Step 2 CK July 2010, Step 2 CS January 2011 and Step 3 February 2015. Master of Medical Science in Education for the Health Care Professions with Distinction (MMedSc), The Queen’s University of Belfast, Northern Ireland - July 2009. Doctorate of Medicine (MD), The Queen’s University of Belfast, Northern Ireland - December 2008. Member of the Faculty of Sport and Exercise (MFSEM), Royal College of Surgeons and Physicians of Ireland (RCSI & RCPI) - March 2008. Member of the Faculty of Sport and Exercise Medicine (MFSEM), The Intercollegiate Faculty of Sport and Exercise Medicine (UK) - October 2006. Diploma in Sports and Exercise Medicine of Great Britain and Ireland (DipSEM), Intercollegiate College of Sports and Exercise Medicine of Great Britain and Ireland (GB & I) - May 2004. Member of the Royal College of Surgeons (MRCS), Royal College of Surgeons, Edinburgh -December 2002. Bachelor of Medicine, Surgery and Obstetrics with distinction in Microbiology and Pharmacology, The Queen’s University of Belfast, Northern Ireland - July 1999. Member of the Society for Clinical Vascular Surgery. Joint Ireland and Northern Ireland Vascular Society Annual Meeting - Winner of First Place - Poster Prize – May 2015. European Board of Vascular Surgery Examination, First Place – March 2015. Society of Clinical Vascular Surgery, Karmody Poster Award - March 2014. Society of Clinical Vascular Surgery International Research Prize (Supervisor to Mr Igor Rychlik) – March 2014. Peripheral Vascular Surgery Society, Fellow Luminaries Program Grant – January 2013. Cardiovascular Research Technologies, Fellowship Grant – February 2013. Mayo Clinic Quality Academy, Bronze Level Certification – July 2013. Royal College of Surgeons Edinburgh, United Kingdom, Ethicon Fellowship Travel Grant – March 2012 to June 2014. Society of Vascular Surgery, 2012 International Scholar Award – June 2012. Northern Ireland Surgical Trainees’ Annual Prize Day, Belfast, Northern Ireland - 1st place - January 2009. Belfast City Hospital Young Investigator of the Year, Belfast, Northern Ireland - 1st Place - 2008. European Society of Vascular Surgery, Travel Bursary Award - 2008. Society of Academic Surgery Prize at the Association of Surgeons in Training Annual Conference, Birmingham, United Kingdom - 1st Place, March 2008. Northern Ireland Surgical Trainees’ Annual Prize Day, Antrim, Northern Ireland - 1st place - November 2007. Exceptional Documentation, Organisation and Performance of Study Endpoints, Walk Study Award of Excellence for Coordinator Achievement - 2006. Institute of Medical Illustrators Annual Meeting, Cardiff, United Kingdom - Bronze Award - 2006. Northern Ireland Vascular Society Research Meeting, Limavady, Northern Ireland - 1st place - November 2005.